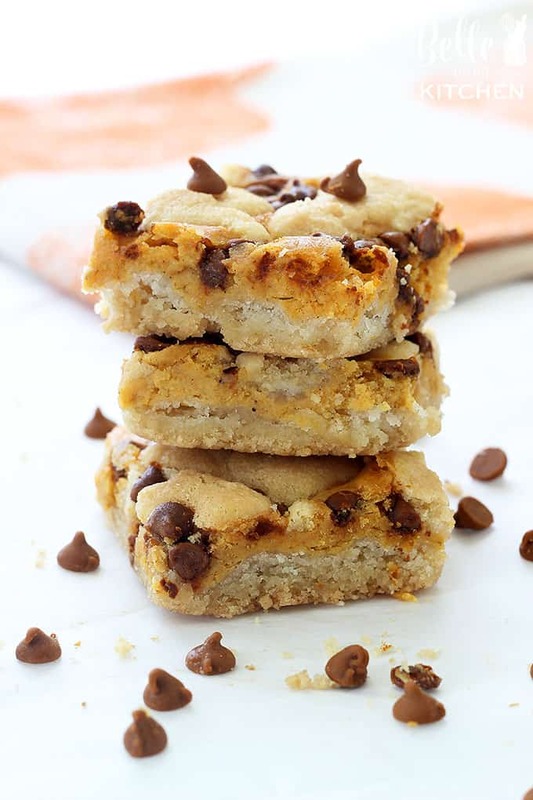 These Pumpkin Cheesecake Sugar Cookie Bars start with a sugar cookie crust filled with a pumpkin cheesecake filling, then are topped with more sugar cookie dough and sprinkled with cinnamon chips! The perfect combination of sweet treats for fall! Pumpkin-flavored-everything season is finally here and I am ALL IN, y’all. Do you love pumpkin spice and all that goes with it, too? Admittedly, I’m probably more of a pumpkin decor fan than I am of pumpkin spiced foods, but it’s hard to turn down a dessert studded with all the flavors of fall, and that’s just what these Pumpkin Cheesecake Sugar Cookie Bars are! I’ve made these about five times since I first came up with the idea, tweaking them a bit and then sending all my test recipes out to my hubby’s colleagues/classmates at school. I’m trying my hardest to practice moderation right now with weight loss having been my big goal for the past five months. I’m proud to say that hard work really pays off, though, and I’ve managed to lose 34 pounds as of my most recent weigh-in yesterday! Weight loss is hard and slow going for me, especially with a baby who is totally dependent on my “mama milk.” Keeping him fed and my supply up has been priority number one, and while its been challenging, I’m happy with the results so far. I’m not one of those lucky ladies who breastfeeds and sheds all the weight without any effort. Nope, it take a lot of discipline, accountability, and salads, haha! ???? 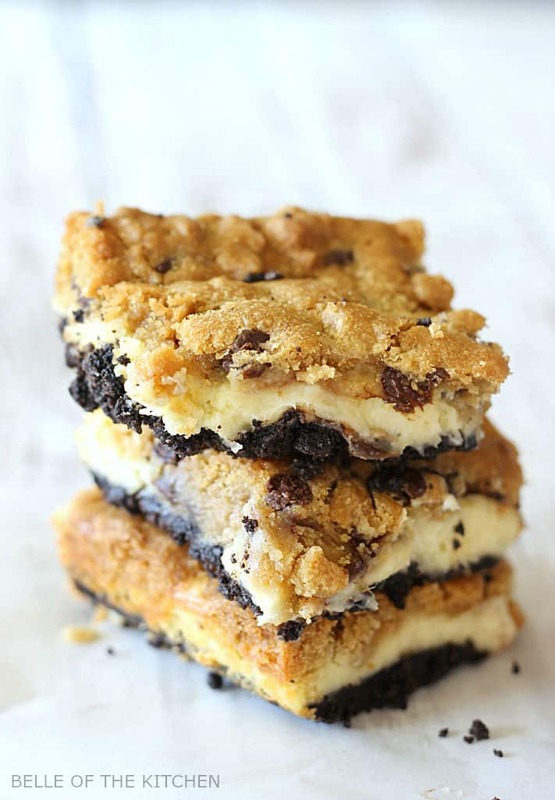 Now after all that talk of self-discipline and leafy lunches, you’re probably wondering where these Pumpkin Cheesecake Sugar Cookie Bars fit in! Well, I’m here to tell you that my healthy approach to life is all about moderation. I love dessert. I always have and always will, and it’s just not possible for me to give it up all together. So, I make sweet treats, portion them out, save a few for myself, then give the rest away! ??? ?If I kept them at our house, that self-control would be a whole lot more challenging. But food is love, y’all, so just make some, enjoy some, then share the rest. Balance is key ???? 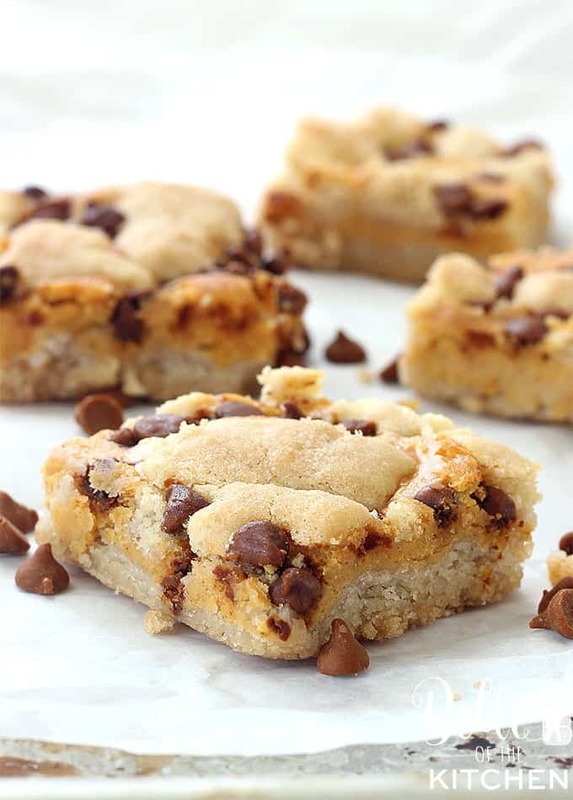 I have made these Pumpkin Cheesecake Sugar Cookie Bars SO many times for friends and family! I get asked for the recipe constantly! Preheat oven to 350 degrees. Line a 13x9 inch baking pan with parchment paper (this helps make it easier to lift the bars from the pan for cutting). Spread 2/3 of the sugar cookie dough into the bottom of prepared pan. Spread evenly and press down firmly to make the crust. In a medium sized bowl, combine the cream cheese and sugar and beat over medium speed with an electric mixer. Add the egg, vanilla, pumpkin pie spice, and pumpkin puree and beat until smooth. Pour over the sugar cookie crust. Crumble the remaining sugar cookie dough in small chunks over the top of the cheesecake filling, then evenly sprinkle the cinnamon chips on top. Bake in the preheated oven for 30-40 minutes until crust is golden and edges are set. Allow to cool completely before transferring the pan to the refrigerator to chill for at least two hours (this helps the bars to set). Store bars in the refrigerator. Enjoy! That looks really good and sounds so easy to make! Love those delicious layers going on! These look totally addictive! Chocolate chips would be great! 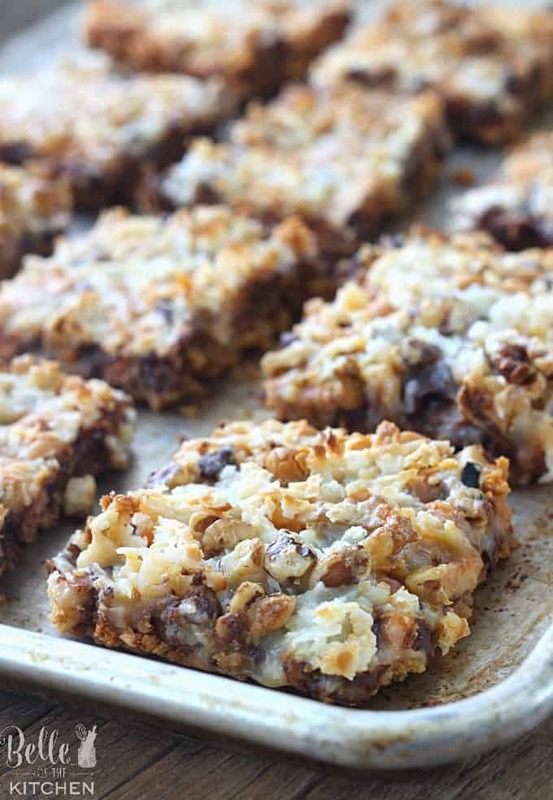 It’s too hot to turn the oven on today, but now I’m craving these gorgeous bars so much I may need to go burn up in the kitchen!! They look amazing, I love anything with pumpkin in! Love the flavors in this cookie and don’t care about the seasonality part of it! 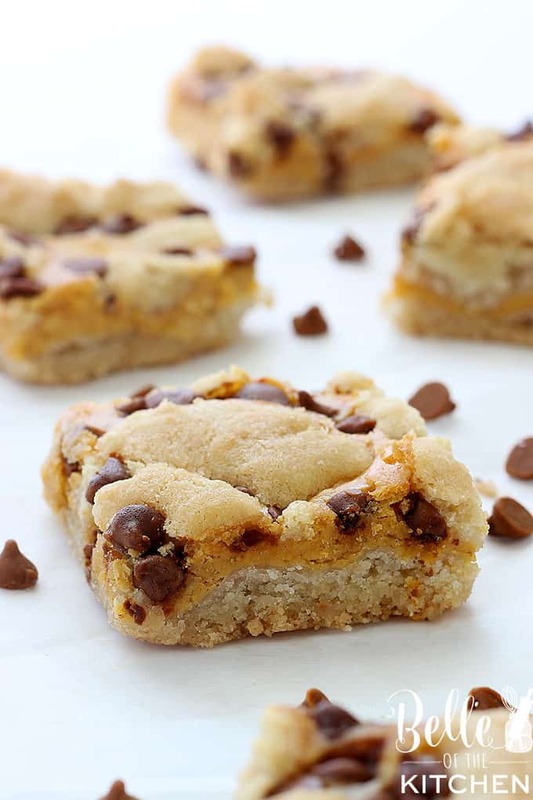 Do love pumpkin in almost any form and these cookie bars look great! Cheesecake, sugar cookie, AND pumpkin? DElicious! I’d have to bake and take though. I’d eat the whole batch. I’ve been seeing these bars EVERYWHERE! They look so good, and I can’t wait to make them! These ave to be the perfect fall treat! I love the combination of flavors! I fully subscribe to moderation! What is life without a little sweet treat every now and then? My hubby’s office gets the rest of all my sweets (let them overindulge and not me) plus I get a ton of great feedback! These look fabulous so I might need to send them a batch of these! Oh wow, these bars sound AMAZING!! My kiddos are going to LOVE them!! I can see why so many people ask for the recipe! They were fantastic! These sound like a perfect fall sweet treat, I love all the autumn flavors going on here and they look so good! I also love how easy they are to make, it would be so easy to whip up a batch if you need a quick dessert! These look so good! I love how creative they are. And I bet they are delicious! I love these bars!! And taking a shortcut and using the premade dough is such a timesaver! I love pumpkin season! Yummy! These look so amazing! I can’t wait to make these for my family! This is the perfect fall dessert! These bars have to be spectacular. I couldn’t have dreamed up anything more decadent or delicious! 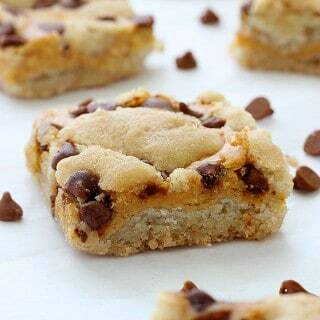 These bars are like all of my favorite sweet treats in one treat. My oh my they look great! Such a fun way to use pumpkin!